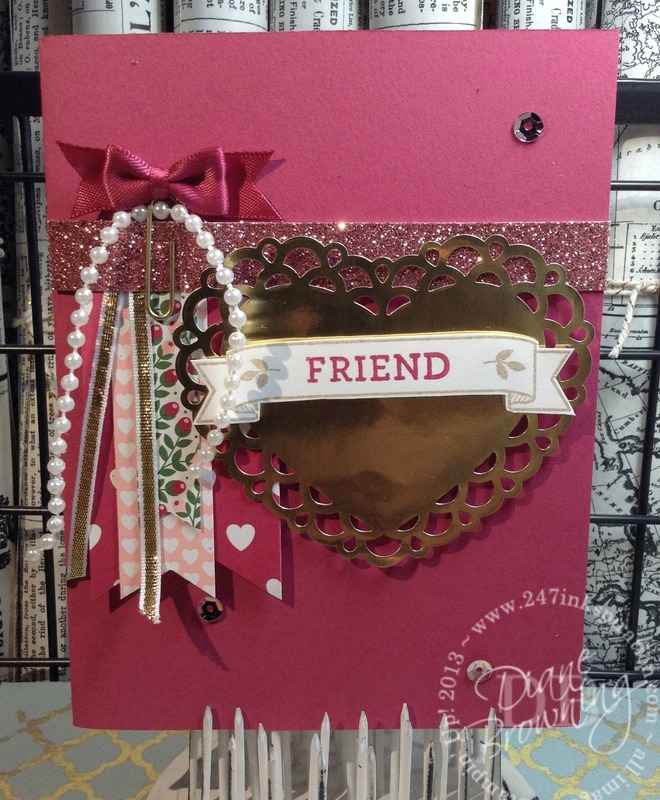 Today I’m sharing another Valentine’s card that’s got more wow factor and uses the Love Blossoms Embellishment Kit. Can I share a secret? Last year, I would have hoarded this little box of goodies and not shared it with anyone because it’s just so adorable. Look at those cute ribbon paperclips! And the gold foil hearts? I’m in love. This year, I’m using it up so I have a (real) reason to buy another box. Who am I kidding? I would have bought another box even if I hadn’t used this one. At least now I feel justified. This card is kind of a play on the image in the catalog with the berry basket. I loved the little flags and the ribbon paperclip holding everything together. I added more ribbon, because why not. And gold is always a good idea. The pearl strand was a little tough. The pearls are too close together to adhere with my stapler, and they don’t knot at all very well. So I tucked them in the paperclip and that holds it just fine. I used my Fine Tip Glue Pen to adhere the sequins. Just a small drop of glue is enough to hold the sequins. If you haven’t tried the Fine Tip Glue Pen, you seriously need to. It’s a life saver. No mess all over the place. I even used this Glue Pen to glue a glass butter dish back together and it’s holding strong. And this to your order right now. This is the Berry Basket image from the Occasions Catalog. I love the Stampin Up Catalogs for all the ideas they provide. It was easy to adapt that same look to the front of a card. And of course you can see I used one of those gold foil heart doilies to help fill in the space. I still have lots of goodies leftover from the Love Blossoms Embellishment Kit. I’m off to make more Valentines! Check back Friday for more Valentine goodness!